We who have disabilities have certain limitations. We understand that and, with the passing of time, we accept them. But we also have abilities in addition to those limitations. If you’ve followed this blog for any length of time, you know I’m manic-depressive. Or, to use the more common name for it, I have bi-polar disorder. People who are bi-polar are limited in different ways; limited in as many ways as there are people with the diagnosis, I imagine. And so it is with anyone who lives with chronic illness or a disability. I believe that, although people with chronic illnesses and disabilities have limitations, most of us aren’t constantly “suffering.” What we’re doing is learning how to manage it; we’re living our lives and sometimes even thriving. Sure, we struggle sometimes. But we also have hope. We manage to put one foot in front of the other (so to speak) and do the necessary things to have a relatively good life. Stress exacerbates any chronic illness, so we must avoid situations we’ve discovered we can’t handle as easily as someone without a disability. The symptoms we often have because of stress could be mental or emotional. They could manifest as physical symptoms. Please don’t expect us to make important decisions when we’re sick. If we’re experiencing a flare-up or an episode of the illness, we may in fact, need your patience as we make simple decisions to just get through the day. If it seems we’re being irritable, you’re right. Some disabilities are noted for having an irritability aspect. For me, this is one of the first symptoms I display when I begin a manic phase–even before I begin the ‘hyper’ activity. I think I can speak for many when I say this is another aspect of having a disability we wouldn’t suffer if we didn’t have to. Most of us have a great attitude toward life. We don’t complain all the time and we’re generally nice people. But if we’re in pain or not able to think our way out of a paper bag, we can get grumpy. Hey, everyone gets grumpy occasionally; people with disabilities are no different. Some of the ultimate limitations are being bed-ridden; inability to communicate our needs effectively; a temporary inability to handle being in public or with groups; not being able to work; and the necessity for some sort of support equipment (i.e., wheelchairs, oxygen, inhalers). However, many disabilities are what we refer to as “invisible.” Please don’t assume someone isn’t struggling just because they don’t need equipment. For the most part, we rely on being educated about our specific disability. Knowledge is power and when we understand what’s going on in our bodies, we’re better equipped to respond to the symptoms. Then we go from being helpless to being able to manage, to a certain degree, what’s happening. We might not be able to rid ourselves of the physical (or mental) state, but we can usually control what we do. We can control our attitude toward our illness and the world around us. Many of us practice some sort of faith. We rely on worship and prayer and are grateful when our friends and loved ones pray for us. People with disabilities usually need to grieve their health. That process may be subtle and we may not even realize grieving is what we’re doing. Frankly, our irritability might be happening because we’re moving toward acceptance of our limitations. I mean, who wants to come out and say, “I simply can’t do some of the things I want to do”? But acceptance is one key to handling our problems. I’ve learned that having a good day might mean leaving the house and moving my focus off myself. I can get the proverbial shot in the arm by simply having a brief conversation with a neighbor or calling someone on the phone to chat. I write letters and notes to friends and family members. Engaging in hobbies or learning a new skill helps too. People with disabilities have much to offer. We might not be able to work even part time jobs. But we can volunteer, we can engage in our communities as advocates for something we’re passionate about, and we can offer a compassionate ear to someone who’s struggling with an illness because we’ve been there ourselves. Over the years, I’ve discovered what Helen Keller said is also true for me. Seeing my illnesses as something I can learn about and learn from helps me to keep a positive outlook even during a flare-up. I know God is with me. Even during a psychic ‘crash,’ I know that when I pray, God hears me. I don’t look like I’ve got it together–and I don’t. But I trust that God is in control. Today, I’m believing less in “self-help” and relying on “God-help.” Ironically, in my most vulnerable states, I realized God can make me strong. In our world many of us think we must declare our independence. We believe our dreams are a result of hard work and self-sufficiency. While there’s nothing wrong with hard work, I prefer to declare dependence. On God. Having a disability doesn’t make me less human. It doesn’t mean my limitations define me. Having a disability doesn’t mean I can’t make contributions to society. I’m a person living my life with purpose because God has promised me that I can. Author’s note: I don’t claim to know everything about every chronic illness. I know some illnesses make an individual totally unable to make decisions for themselves and caregivers are needed to help them navigate life. This post about the abilities and limitations of people with disabilities is not all-inclusive or meant to be medical advice. The comments herein are taken from observations of my friends’ conditions, conversations with those individuals, and my own experience with several chronic illnesses. For those interested in such things, many support groups exist addressing the needs of a variety of illnesses. And on it goes—right into adulthood! “And the Lord—who is the Spirit——makes us more and more like him as we are changed into his glorious image” (2 Corinthians 3:18b). “Praise be to the God and Father of our Lord Jesus Christ, the Father of compassion and the God of all comfort, who comforts us in all our troubles, so that we can comfort those in any trouble with the comfort we ourselves have received from God. For just as the sufferings of Christ flow over into our lives, so also through Christ our comfort overflows. If we are distressed, it is for your comfort and salvation; if we are comforted, it is for your comfort, which produces in you patient endurance of the same sufferings we suffer” (NLT). The Greek word translated comfort isparaklesis. It is a calling near, summons for help; a prayer, a plea; exhortation, admonition, encouragement; consolation, comfort, solace, refreshment; or a persuasive speech, motivational talk, instruction. And it’s feminine case. No one comforts like a mother. So, sorry, we can’t always answer the “why” questions, but we can answer these three. Condensed from The Psalms of Asaph: Struggling with Unanswered Prayer, Unfulfilled Promises, and Unpunished Evil by James N. Watkins. When I was a child going to Sunday school in the basement of my church they used “flannelgraphs” to tell Bible stories. A flannelgraph consisted of a flannel-covered board on an easel and cloth Bible characters. The characters stuck to the board as you placed them. Then you’d peel them off and place more characters while telling the story. There was Joseph and his brothers; Noah, the ark and the animals; and of course, Jesus. The stories I heard about Jesus in Sunday school always made him sound larger than life. He worked miracles healing people and made a little bit of food go around to feed a multitude. He was a pretty awesome Jesus. Then I’d go upstairs to ‘big church’ and the pastor’s message about Jesus was that he died on a cross for me. That kept Jesus in the larger than life realm. Not knowing exactly what a crucifixion entailed, I assumed it was pretty bad and that I was lucky Jesus would do such a thing for me. The pastor talked about how angry God was about sin and how much I needed his forgiveness. He was a pretty awesome God too, but for different reasons. I made a decision to ask God to forgive me and said a prayer, asking Jesus to come into my heart. God and Jesus fell into the larger-than-life category for a long time. And there’s nothing wrong with that; they are larger than life. But something was missing and it kept me from really knowing how much I could benefit from the decision I’d made about Jesus. I didn’t know it then, but what I was missing was Jesus with flesh on. Skip ahead several years. I had become confused and disillusioned by church, leaving it to try my own way of living. I still believed in God, but he wasn’t part of my worldview. Then something happened to create in me a hunger for him and I returned to the church. Because I was hungry for God, I began to read my Bible. In fact, I devoured it. Guess what I found? I found a Jesus with flesh on. I don’t remember the folks in the church where I grew up talking about Jesus as a man. They must have, but I was young and mostly hearing the anger part. I never really got a glimpse of Jesus with flesh on until I read about him for myself. As I traveled through Galilee and the Judean countryside with him and his followers I watched him interact with people like a real person would. I saw him express emotions like anger, joy, and grief. He got tired and slept. He got hungry and ate. He interacted with friends and with some Pharisees (who weren’t always counted among the friendly). He worshiped on the Sabbath. He engaged in normal human activities found easily if you look in scripture. Maybe it’s the storyteller in me that looks for what’s hidden. I look at more than just the words, and I read between the lines. For starters, he was a carpenter. Imagine Jesus banging his finger with a hammer and getting one of those black fingernails. We know he had sisters and brothers and, though we aren’t told much about his childhood, it must have been a fairly normal one with playtime, chores, and “school”. Then his ministry began. Look at the loaves and fishes story. After Jesus multiplied the food for the crowds, he sent his disciples on to Bethsaida “while he dismissed the crowd.” (Mark 6:45) Call me goofy, but I see Jesus talking to people as they leave as if he knows them personally. It’s not a “Hey, all of you, clear out of here now” type of dismissal. It’s the type of thing a host would do, saying goodbye to as many as possible and seeing that their needs are met. Anyway, that’s the Jesus I was getting to know. I got to know this Jesus who was a single man all his life while many his age would have been betrothed or already married. Jesus lost a relative, John the Baptist, to a cruel death and took time to grieve alone before he was called again to minister to the crowds. Jesus’ closest relatives misunderstood him to the point that they tried to manipulate his actions, thinking they knew better what he should do. At a crucial moment, his best friends deserted him. One of his friends took his own life. After becoming familiar with this Jesus, I realized that I need the God who’s larger than life and truly awesome. But I also need this Jesus who has been human and can understand what it’s like to be me. Many of us have no mate, have grieved the loss of a close relative, are genuinely misunderstood, and have been deserted by a friend. Jesus with flesh on makes him able to relate to us in every problem and in every success. God wants to get up close and personal. He wants us to know he’s not just a flat personality we peel and stick to our circumstances when we need him. He’s a fleshed-out God who relates to every situation in which we find ourselves. And his desire is that we’ll get to know him as that pretty awesome Jesus. 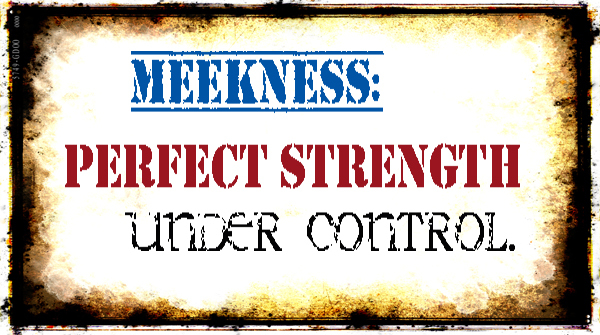 In some Bible translations, the word ‘meekness’ replaces the word ‘gentleness’. 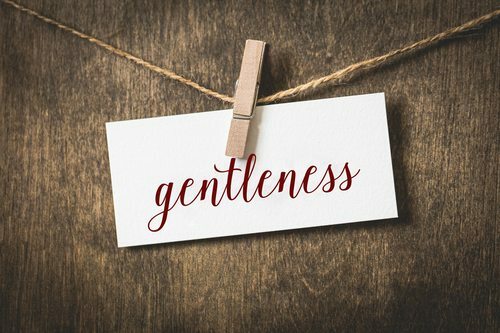 Many of us struggle with a clear definition of the word ‘meekness,’ but we know for sure the demonstration of gentleness when we see it. We picture a mother holding her baby’s finger for the first time. A dad scrubbing with his hand the dirt from his child’s skinned knee. The way we would take a fish off a hook. Removing a splinter. Holding an elderly person’s hand. The perfect example of gentleness, of course, is the manner in which Jesus handles us. Sure, He can be stern when He needs to be. (That’s how He handled demons.) For the most part, however, Jesus treats us as only a loving God can. Gentleness is one of His attributes and He can’t deny His own character. The Golden Rule–which takes mercy into account–instructs us in gentleness. Please listen today to the voice of the Holy Spirit in communicating with others. Some storytelling that leaves you feeling really good and challenges your thinking. Here is a book with a title that, if you cannot relate to it, you only need read a few of the short essays and you soon will. These “pastor’s thoughts” wake you up to just how good life is even if a few bad moments come in an otherwise pretty good day. When Father Jim O’Leary first released the book, I was so happy to see it. I’ve had the pleasure of experiencing first-hand his words of wisdom, humor and kindness. Reading the book again after many years, I hear his voice and see that twinkle in his eye. 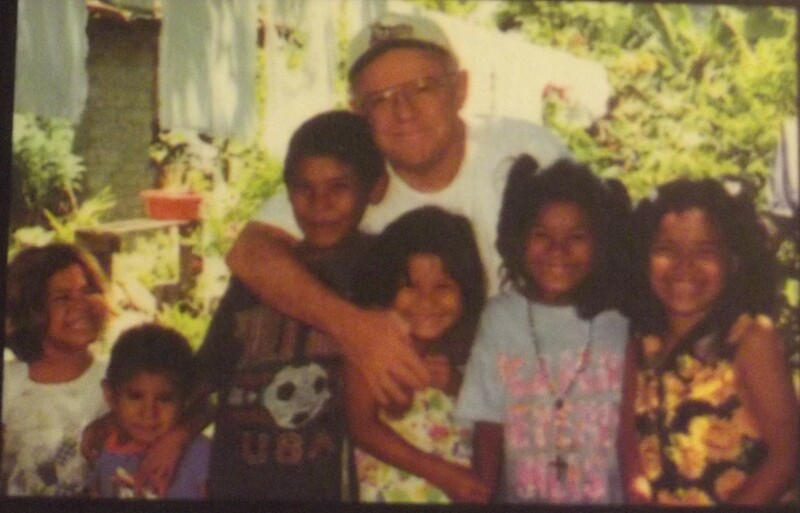 Father Jim shares insights into Catholic traditions, travels in Europe associated with his calling, missions trips, parenting, growing up in Michigan, and eventually serving there. He tells stories about simple living and what he learns from everyone he meets. While he may have rubbed elbows with some pretty important people, it’s obvious he’s energized by conversations with folks like you and me. I haven’t met many people as humble as Jim O’Leary. Of course, he’d get a sour look on his face, glance at his feet, and shake his head if he heard me say that. And that’s because, as I knew him, he really was a self-effacing man. He did laugh. “Just don’t call me what my parishioners call me,” he said. In a matter-of-fact style and with a straight face, he said…No, I better not. It wasn’t a nice name. But I’m sure he was joking with me as well. That twinkle in his eye, you see. “I Think I Am Happier Than I Think I Am” is filled with stuff like this. No, not bad words. But his way of seeing things. His constant love for God and for people. His explanations about Jesus and His earthly ministry. Metaphors for life derived from everyday observations. Father Jim doesn’t try in his book to convert anyone, but it’s plain he hopes you’ll believe in the One who was born, preached the Good News, and died to save us from ourselves. Jim always admitted that he needed saving from himself and his stories reveal his gratitude for God’s mercy. The essays are gleaned from his columns originally published in the weekly St. Joseph Parish bulletin. Jim was a priest in the Battle Creek parish where I live. He was not my priest; as I mentioned, I’m not Catholic. But he was a good friend. The last time I saw him, we were both at a local American Cancer Society Relay for Life. Both cancer survivors, we met on the track and shared our news, chatting like old friends do. I’m so glad I read the book again. It feels like we’re having another of those chats. Gosh, I miss him. In our relationships, we value trustworthiness in people. We want to be able to rely on them. The Holy Spirit grows this virtue in us as we follow Jesus, being obedient to God and His purposes. God is the One we can trust for everything. When friends and family let us down–and they will–we know God is faithful even when we and others fail to be all we could be. 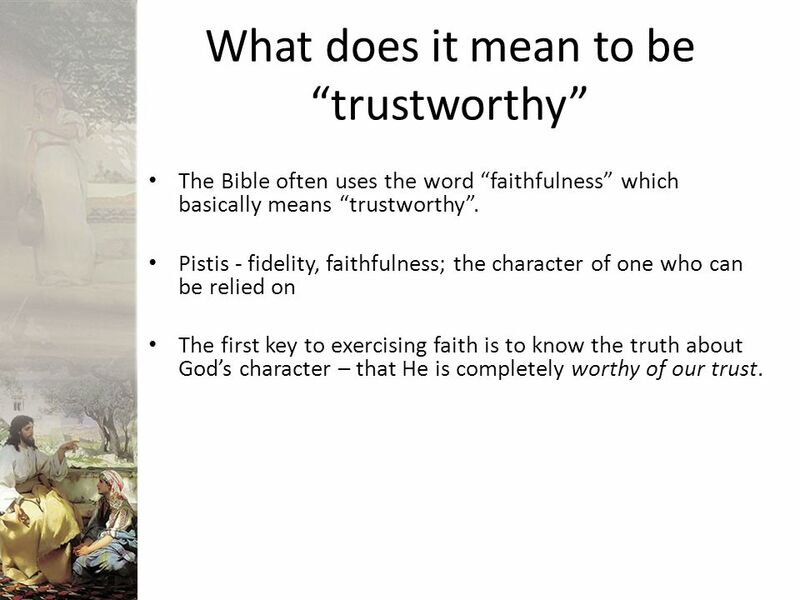 Growing in the other Fruit of the Spirit, we learn to be trustworthy. We are faithful to God and begin to improve our earthly relationships because God is teaching us a better way. Joy is a gift. 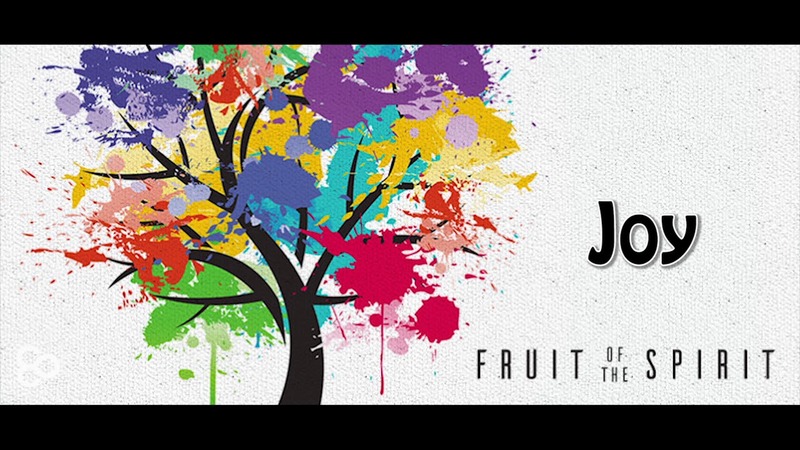 Like the other fruit of the Spirit, it’s not something we conjure up. It’s present in our lives because it’s the joy of our Lord. What a gift to receive. Why would anyone not want the joy of our God? Joy can be described as exhilaration, delight, sheer gladness, and can result from a great success or a very beautiful or wonderful experience like a wedding or graduation but the definition of joy that the world holds is not nearly as amazing as biblical joy. The joy we experience as we follow Jesus can be overwhelming and it’s often associated with gratitude, lack of worry, a simple life, a full life. Not to mention being in constant contact with God and availing ourselves of His love. When we know our identity in Christ, joy must naturally follow. That’s a joy we want everyone to experience, so we take the story of Jesus to everyone as often as possible.